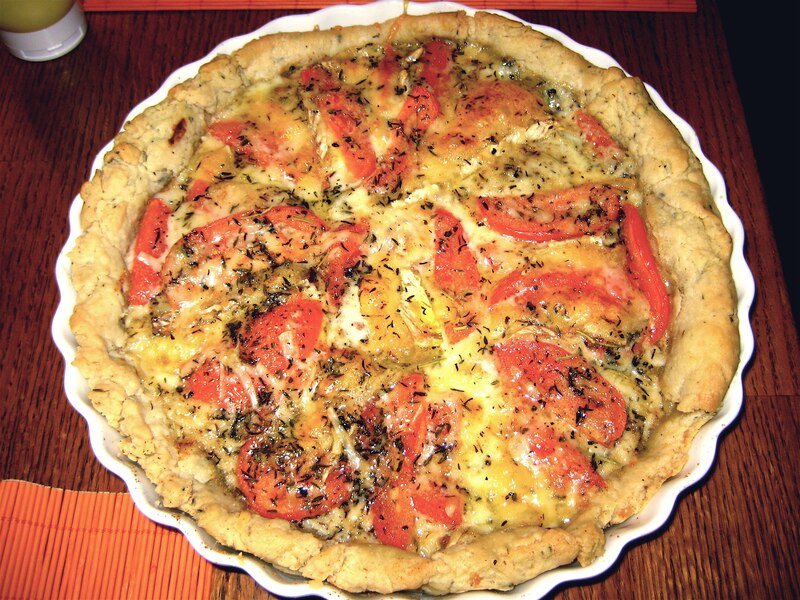 Tomato Gruyere Camembert Tart – Voila! This delightful and savory tart is from the blog the daily green. I added my own touches to it, marked by italics. I made it as a side to salmon, although a white fish or just a big salad would pair nicely. It’s also a great brunch treat. It’s so versatile — don’t you just love those types of dishes? 1. Combine flour, butter, dashes of salt and pepper. Mix until it’s coarse and crumbly. 3. Using a fork, mix 2-3 T. of oil and 1 T. water. Mix until dough begins to cling to each other. 4. Shape dough into a ball, then flatten into a disc. Wrap with saran wrap and refrigerate for 30-45 minutes. 1. Roll out dough into wide, thin circle. Place in tart pan. 2. Spread 1 T. mustard evenly over bottom of tart shell. 3. Sprinkle gruyere evenly over mustard. 4. Then layer tomato, camembert and a little extra gruyere. At each layer add a dash of spices. 5. In a small bowl, mix together 1/4 C. olive oil, and spices. Using spoon or brush, pur carefully and evenly top of tart. 6. Bake for 30-35 minutes. Serve warm. Pingback: Cooking with Friends! « Voila! Pingback: Walnut Goat Cheese Salad with Roasted Red Peppers « Voila! Pingback: Mushroom Spinach Tart « Voila!